We got going by 6:40am and the wind was gone! Two days of strong cold wind was plenty for us, so we were really excited to start the day off without wind. It was still pretty cold. We kept our down jackets and beanies on all morning. I’ve been meaning to get a photo, but my sleep sock gloves (I lost my gloves two days ago) have been wonderful! 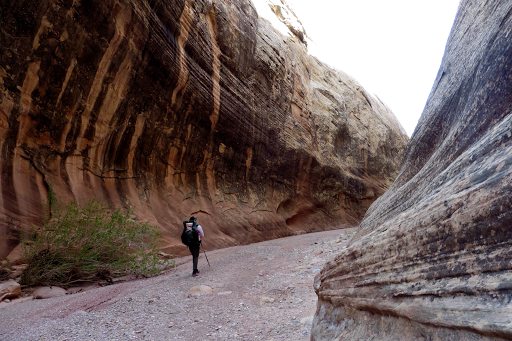 The first 8mi of the day took us through the incredibly scenic Lower Muley Twist Canyon. 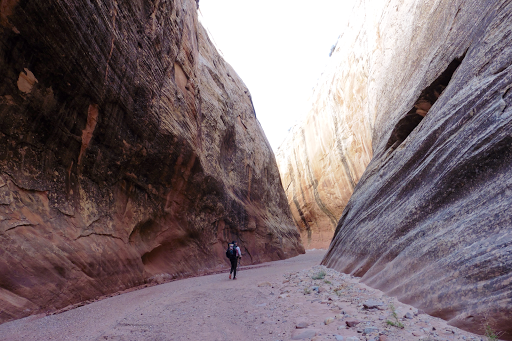 This is one that will probably rank as one of the favorite canyons of all the ones we’ll go through on this trip! Again, my camera was acting up in the early morning cold, so iPhone shots for some. 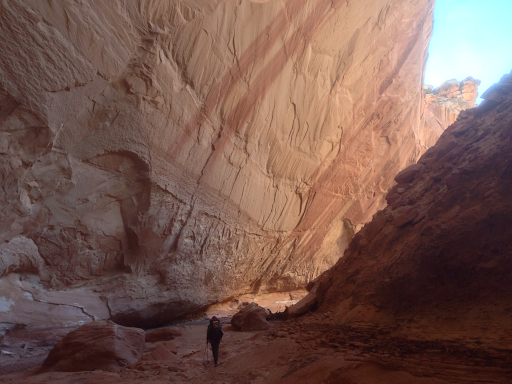 The canyon just snaked and wound from one awe inspiring scene to another. 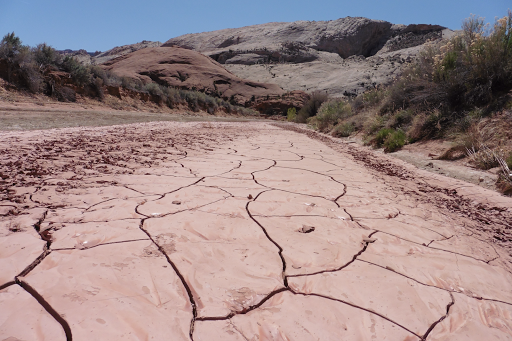 Lots of reddish peach colored slick rock. Also, massive amphitheater looking alcoves and sheer cliff walls going straight up 1,000ft that we could stand right at the base of and look up at with that dizzying feeling of looking up at a skyscraper. 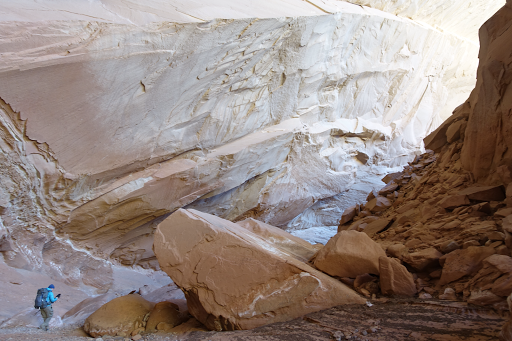 When the canyon would widen at times, it would be like walking in a museum with uniquely perfect rock formations of all shapes and sizes lining the path. There were also dark black stripes made from lichen where water runs. We took sooo many photos! 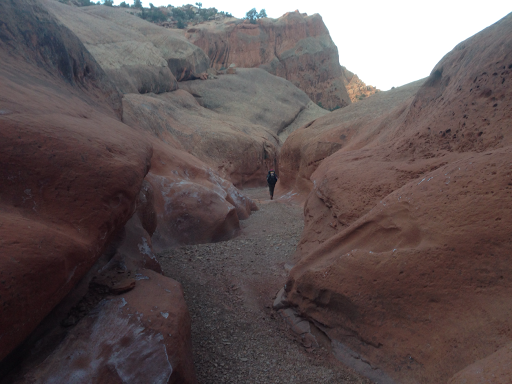 It was also very relaxing walking and nice to get a break after the intense physicality of the last two days. 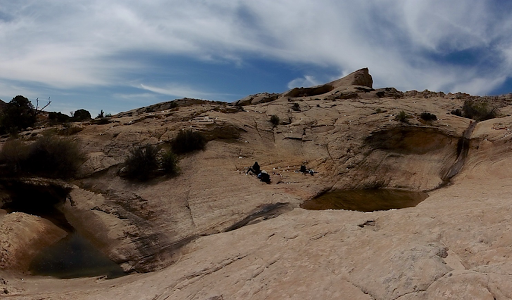 Our lunch spot was the “Muley Tanks” which were two large potholes of water. It was a wonderful spot for a break and we celebrated a sand free lunch spot and the ease of which we could lay out our things free of worries of strategically keeping sand out of things. I still managed to get a nice peppering of sand in my lunch when I haphazardly shook the sand out of my sock and flung it into my pot. We again made dinner for lunch and took 1.5hrs to relax and eat. It’s been nice to do it this way and also makes the evening go smoother with no cooking and no worries if we don’t get to camp near water. Just as we were packing up to leave lunch, Gavin walked up! 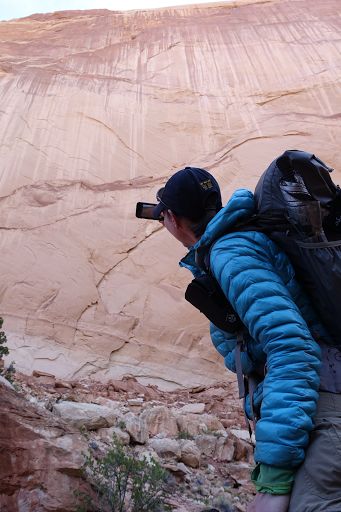 He was supposed to have hitched into town yesterday as he planned to split this 8 day leg in half and hitch to Boulder from Capital Reef National Park. 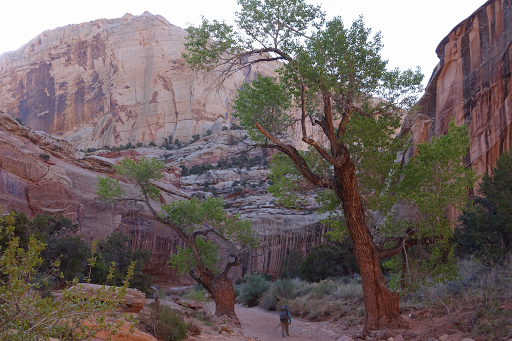 Turns out that two guys he asked for a hitch offered him enough food to get him to Escalante, so he was able to keep hiking. Bad news is that he didn’t see my lost gloves, dang! We hiked on as he started his break. 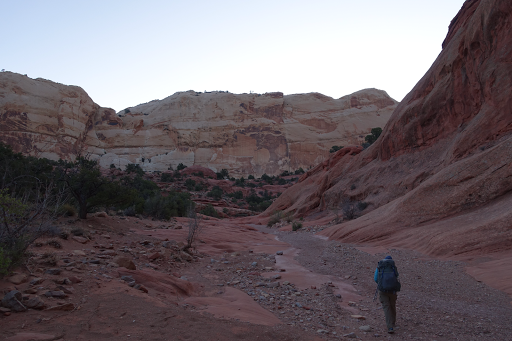 The official route on this leg follows the Escalante River for something like 20mi for a terrible slow slog. Most choose one of the two alternates for obvious reasons. One is a long road walk that avoids the water and the difficult hitch on a remote road. The other, which we chose, is the Stevens Cyn/Halls Creek Alt by Li Brannfors (who’s maps we are using and LOVE!). 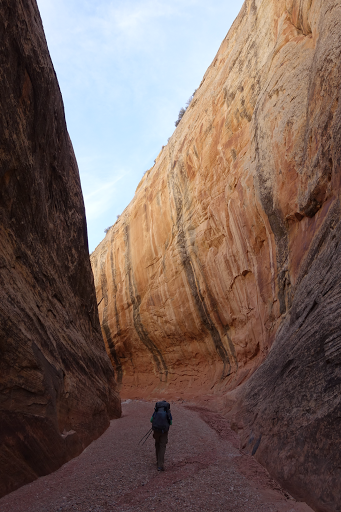 This alternate saves ~8mi, has you walking a wide sandy wash, and has an option to do the Halls Creek Narrows, which some have said was a highlight of the hike. 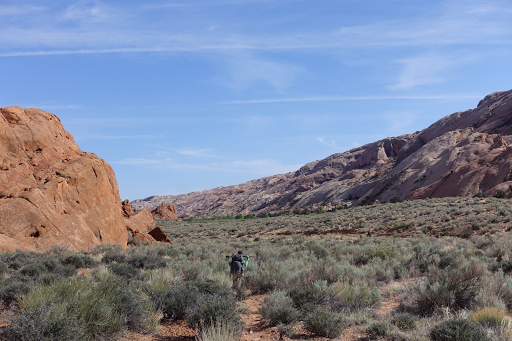 We hiked the wash which varied as a deep sand trail, slightly muddy clay, and hard packed dry clay. Pretty smooth sailing. I listened to over 3hrs of a new audiobook called The Interestings. I’m just 1/4 of the way in and it’s still setting up for a big shift that I’m sore is to come, so no opinion yet on the book. It was really nice out with temps in the upper 60s and a light breeze from time to time. Just a nice, relaxing day. We did meet and talk to one other couple out for the week going the opposite direction as us, so no complete solitude again today. We are camped at the entrance to the Halls Creek Narrows and are excited to go through tomorrow morning. We got to camp at 6:30pm and did 23.5mi according to the map. The GPS said we did 26mi, which is well known for the Hayduke that the mileage is longer than the map says. This may go down as our biggest mileage day as it’s rare to get much over 20mi in a day out here. 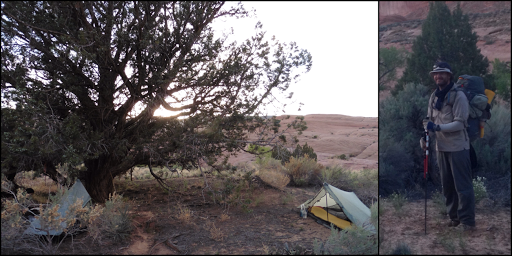 Around 8pm, Gavin hiked up and is camped on rock nearby. He might get up early to join us for the narrows. Another incredible day on the Hayduke!